Here you will find information about creating a video on your iPhone and iPad, and learn how to edit video on your device using the iMovie mobile app downloaded from the Apple Store. The app might already be on your iPhone or iPad, and is a free. Information on user engagement for video, along with tips for shooting better video are include below. I always welcome information on mobile tech tips! Learn more about this iPhone video shot at Isle Royale National Park. Less is always more, almost always for video. Wistia, wistia.com, an online web hosting service for business want to host videos and receive as much data as possible about videos, allowing for information about when viewers stop watching and other important viewer information. Two minute videos are the best length if you want viewers to get the full message. 30 second video will hold viewer’s attention about the same as a two minutes video. Every moment counts when you have something to say. If you don’t deliver what you need in the first two minutes, it could be viewers will miss the information as they have already stopped watching. Wistia notes only 70 percent or viewers are watching two minutes, after that point, second counts. My thoughts – Not all videos can be done in a few minutes, so think about continuing in a new view, such as part one, part two and so on. Longer videos of 6 to 12 minutes is the second sweet spot. Viewer engagement loss levels off after 6 minutes. Every moment counts between 6 to 12 minutes. Engagement will hold steady from 6 to 12 minutes, but every moment will count from 2 to 6 minute mark if you want viewers to watch a video to the end. Proceed with caution if you need to make a video longer than 12 minutes. The viewer drop-off for 12 to 20 minutes is less steep for the 2 to 6 minute video. It’s likely more expensive to make a longer video and will take more to create. Video length – Make a great video and the engagement will follow. Give viewers a way to share link to watch video later is also a great way to encourage viewers to watch the complete video. Wistia has an entire on their website devoted to learning more about creating video. Watch video about educating employees about being on camera. If you are shooting hand-held video with your iPhone, iPad or any smartphone, there’s a few things to start doing right now to give your videos a more professional look. Shoot horizontal video, unless an app requires you to shoot vertical. Become the tripod (tree legs), or bipod (two legs): The more stable you are, feet firmly planted on the ground will make your video more stable. Create video kit – If a little planning you can create a simple video kit with microphone, tripod and lights to create even better video. iOgrapher makes cases you can mount iPhones, iPad and more. Smartphone Adapter – Mefoto creates a mount to connect smartphone to a tripod. Joby has several tripods and tripod mounts. Glif is a camera mount that adjusts to the size of your smartphone. Austin Mann, tests latest models of iPhone, featured by Apple. See latest review of iPhone 7 and equipment list. If you have your own YouTube Channel, start looking at your YouTube analytics page to find out more about how long viewers are spending on a particular video. Below is a screen shot from one of my video editing tutorials. Mobile Video Editing with iMovie app for iPhone and iPhone -Practice using iPad with mobile iMovie app to create quick mobile video. Practice shooting a short video, no more than 2 minutes, with the iPad and learning to edit it in class, uploading to your YouTube account. The emphasis is learning, to use the iPad, iMovie and uploading to YouTube. Music (optional) – You can use the music, not required, for this video, part of the iMovie App. It’s good to know how to work with music. Titles – Try creating an opening title and credits title with videographers names, date and location. Copyright – Include copyright details: Example: ©2016 Jim Smith. All Rights Revered. CAUTION: (For SCSU students) If you do not download your video from the iPad, it will likely be deleted. You can also delete any video that’s on your the iPad you use to make sure you have enough storage to shoot your video. If you will be shooting your video on your iPhone or iPad, and editing on you computer, try using the Image Capture application instead of iTunes. See details below. Complete title and caption area, make video UNLISTED, PUBLIC or PRIVATE. 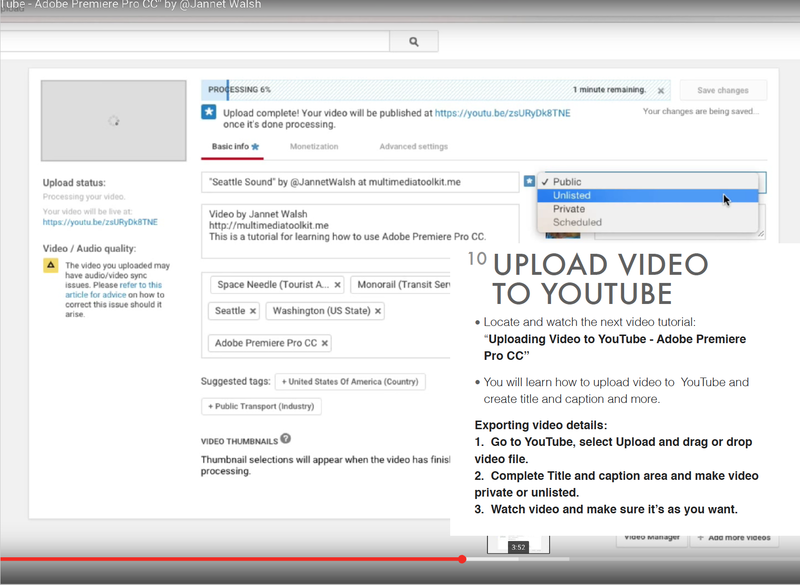 Here is a screen shot from a YouTube Director template to create video. Click on photo to learn more about YouTube Director. Video made with YouTube Director bumper toolkit.